Sunday Nov. 9, 10:30 a.m.
On November 11th Canadians will gather across the country to honour those who died in the service of Canada. Thousands will be present at the War Memorial in Ottawa, the scene of that horrific and cowardly act against Corporal Nathan Cirillo just a few weeks prior. Some have used this event to promote policy, asking on the one hand for stronger measures to fight terrorism at home or abroad, or on the other hand to withdraw from involvement in foreign conflicts that have consequences at home. Let us not allow ourselves to be distracted this Remembrance Day by these debates. Let us remember Corporal Cirillo and Warrant Officer Vincent the same way we remember all those who died in the service of Canada, prepared to stand against evil and tyranny, in the name of peace. This solemn time will be framed by two passages of scripture – Micah 4:1-4 reminding us of the ultimate reality towards which we are called to work, one of swords being beaten into plows and all peoples united in peace, and Matthew 2:16-18 reminding us that in the meantime political powers can wreck violence upon the innocents. Our series through the exhibition Rembrandt’s Circle continues with a canvas by Jan van Noordt. 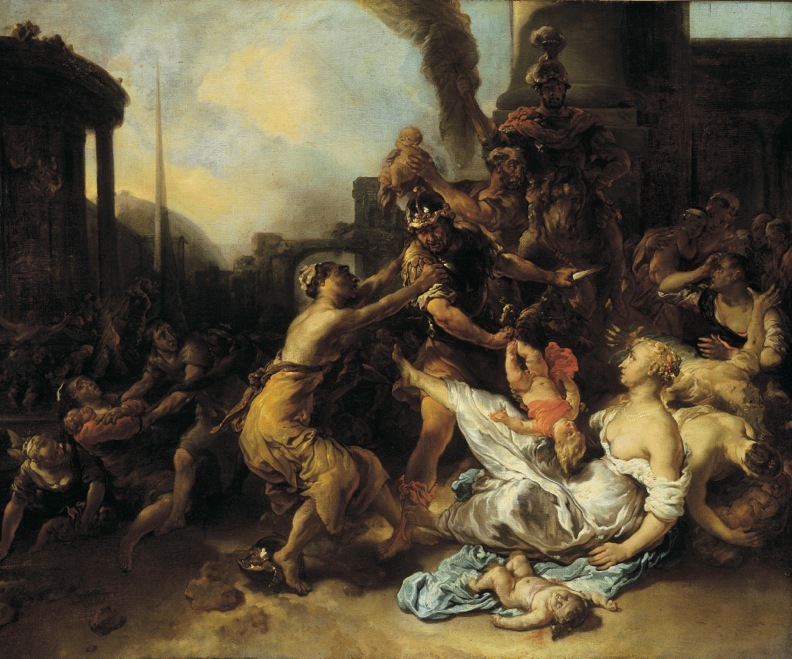 Jan van Noordt, The Massacre of the Innocents, around 1660, oil on canvas. Agnes Etherington Art Centre, Queen’s University.